Without a doubt the most emblematic monument of the town of Ronda. When you think of Ronda what comes to mind is the bridge, the views offered. 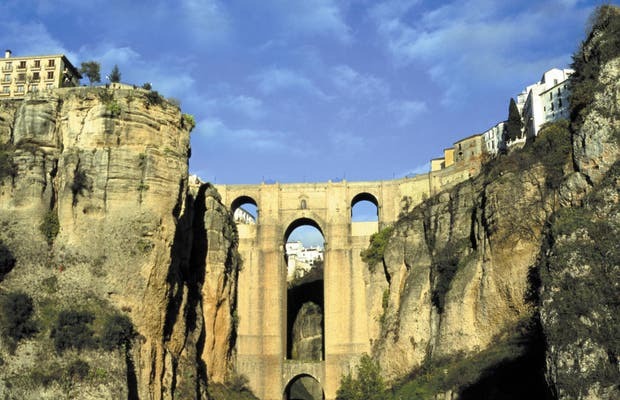 The fall is about 100 meters and the Tajo de Ronda passes underneath. It is a classic to take a photo of the bridge despite the difficulty of reflecting what is seen from there. The best views of the bridge are from the Gardens of Cuenca. Spent New Year's Eve in the town of Ronda, Spain. We arrived just before sunset & trekked down the side of a mountain to get this shot of one of the most amazing man-made wonders I've ever seen. I was totally transported back through history.